In experiments using mice, a team of UC San Francisco (UCSF) researchers has discovered a gene that plays an essential role in noise-induced deafness, according to an article in UCSF’s news center. Remarkably, by administering an experimental chemical—identified in a separate UCSF lab in 2013—that acts on the pathway linking this gene to hearing loss, they found that they could prevent noise-induced deafness in the mice. The researchers said a similar drug to the one used in their study might one day be used as a hearing-protection regimen before working in a noisy environment or going to a loud concert. They’re also looking at whether it could be taken shortly after exposure to loud noise to protect hearing, such as when soldiers are exposed to explosions on the battlefield. Whether of environmental or genetic origin, hearing loss is almost always caused by damage to sensory “hair cells” in the cochlea, which detect sound waves and transmit auditory information to the brain. 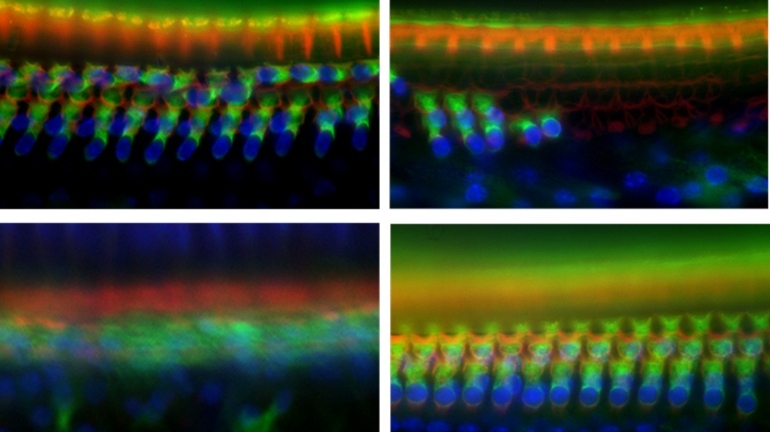 Unlike many types of cells in the body, if hair cells die, they cannot regenerate. As reported in the October 15 issue of The Journal of Clinical Investigation, researchers led by Elliott Sherr, MD, professor of neurology and of pediatrics at UCSF, were interested in a gene called Tmtc4 for its potential role in brain development. When the team deleted the gene in mouse embryos, they were surprised to discover that the mice became almost completely deaf by one month after birth. 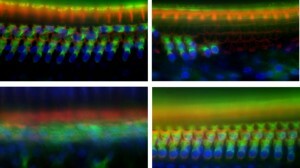 Upper left: Inner hair cells (orange row at top) and outer hair cells (blue/green array at bottom) in the cochlea of mice lacking the Tmtc4 gene, 10 days after birth. Upper right: Substantial decrease, through cell death, of both types of hair cells, 30 days after birth. Bottom left: 45 days after birth, no hair cells remain. Bottom right: For comparison, outer hair cells in a normal mouse 30 days after birth. Credit: Sherr and Chan labs/UCSF. The Tmtc4 protein normally plays a role in the endoplasmic reticulum (ER), a structure inside the cell that helps regulate the majority of protein production. Working with Chan, Sherr’s group found that the loss of Tmtc4 in cochlear hair cells distorted the delicate balance of calcium that ordinarily exists between the ER and the rest of the cell and triggered the unfolded protein response (UPR)—a quality control system that causes a cell to self destruct if it’s producing faulty (and perhaps dangerous) proteins. The UPR triggered hair-cell suicide, ultimately leading to total deafness. Because the mice could hear normally after they were born, the researchers realized that they weren’t dealing with some form of congenital deafness. Instead, they suspected that the rapid hearing loss observed in Tmtc4-deficient mice was due to a heightened sensitivity to normal sounds. To test this hypothesis, the researchers exposed normal mice to loud noises and found that this triggered hair-cell death triggered by the UPR, just as was seen in the mice lacking Tmtc4. To avert noise-induced hearing loss in the mice, the scientists needed to somehow block the UPR and prevent hair cells from self-destructing. Fortunately, they were right down the hall from Peter Walter, PhD, a professor of biochemistry and biophysics at UCSF whose lab identified a drug in 2013 that does precisely that. The compound, known as ISRIB (for Integrated Stress Response Inhibitor) inhibits part of the UPR; it has been shown to reverse memory failure caused by traumatic brain injury in mice and to kill aggressive prostate cancer cells. Giving the mice ISRIB before they were exposed to loud noises prevented hair cell damage and noise-induced hearing loss, and Sherr says the researchers are now looking to see if the treatment would be useful to prevent other types of hearing loss, including age-related hearing loss. Authors: Additional authors on the paper include Jiang Li, MD, PhD; Omar Akil, PhD; Stephanie Rouse; Conor McLaughlin, MD, and Ian Matthews, of UCSF, and Lawrence Lustig, MD, of Columbia University.